David Bowie fans are raising money to build a three-story lightning bolt memorial statue in the Brixton neighborhood of London where the musician was born, Pitchfork reports. Modeled after the distinctive make-up of Bowie's Aladdin Sane character – as featured on the cover of his 1973 album of the same name – the statue would stand five streets from Bowie's birthplace. 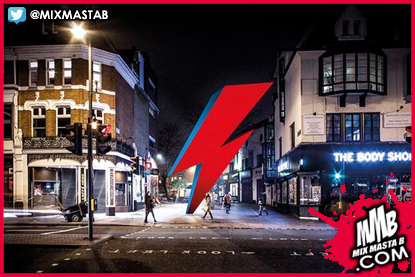 The statue would accompany an Aladdin Sane mural painted by Australian artist Jimmy C. situated opposite the Brixton subway stop and near several prominent London clubs. The artists and project managers behind the statue, a group called This Ain't Rock'n'Roll, are reportedly working on the project with the city of Brixton and Bowie's team in London and New York. 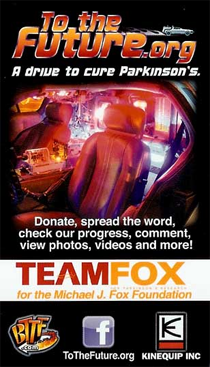 The group is looking to raise £990,000 (approximately $1.2 million) by March 21st. Donors will also receive a variety of gifts from the crowdfunding campaign, ranging from T-shirts and pendants with the lightning bolt logo to limited edition Bowie prints and a 3D-printed replica of the statue (lovingly referred to as The Ziggy Zag). Last year, a separate crowdfunding campaign raised £100,000 to build a memorial statue in the town of Aylesbury where Bowie first unveiled his Ziggy Stardust character. Berlin also unveiled its own memorial plaque located at the building where Bowie lived from 1976 to 1978 while recording his iconic Berlin trilogy, Low, "Heroes" and Lodger. Bowie died in January 2016 after a long, but largely secret, battle with cancer. He was 69.